Phil Vassar (born May 28, 1964 in Lynchburg, Virginia) is an American country music artist. Vassar made his debut on the country music scene in the late 1990s, co-writing singles for several country artists, including Tim McGraw ("For a Little While", "My Next Thirty Years"), Jo Dee Messina ("Bye, Bye", "I'm Alright"), Collin Raye ("Little Red Rodeo"), and Alan Jackson ("Right on the Money"). In 1999, he was named by ASCAP as Country Songwriter of the Year. Later that same year, Vassar was signed to Arista Nashville as a recording artist. 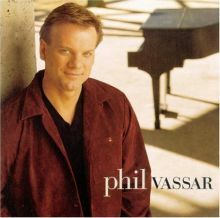 His debut album, Phil Vassar, was released in early 2000; it produced five hit singles on the U.S. Billboard country singles charts and was certified gold in the United States. He followed it in 2002 with American Child, Shaken Not Stirred in 2004, and finally Greatest Hits, Vol. 1 in 2006 before Vassar left the label for Universal South Records. His first album for that label, Prayer of a Common Man, was released in early 2008. He has charted nineteen singles on the Billboard Hot Country Songs charts, including two Number Ones: 2000's "Just Another Day in Paradise" and 2004's "In a Real Love".